Mark May 22 on your calendar under Tokyo mobile madness. In the space of a few hours we had an avalanche of new handset models – 27 in all – announced by both KDDI au and (see our previous post) SoftBank Mobile. The Okura hotel was swarming at 10am as the wraps came off au’s Summer 2007 lineup and of course they have their usual dedicated, and slick, Flash site online Here. It will take us a little while to plow through the complete details of each model, available in Japanese, meanwhile we have compiled a quick overview for you after the jump. Three units announced come from Sanyo, including a waterproof digital tv model, the W53SA, and a token Global Passport unit. we see two new Casio designs, one offering the Exilim branded 5 megapixel camera-phone and a 2nd bathtub safe 1Seg tv unit. Sony Ericsson adds another Walkman branded model, the W52S, with 2GB on-board memory while Panasonic and Sharp each have ‘stylish’ designs full of the regular goodies. Toshiba added two new handsets to the fleet with their W54T slider boasting a stainless steel body and Kyocera has introduced new three models, all focused on slim and simple designs. 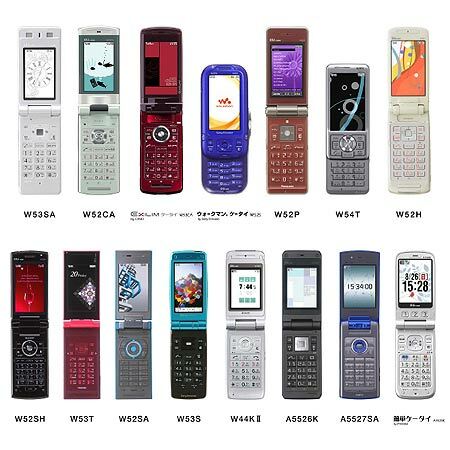 All units (except Kyocera’s), come with the full range of services including; Lismo music (and video) store, GPS, EZ-FM, FeliCa m-commerce, Hello Messenger, PC Site Viewer to name a few.